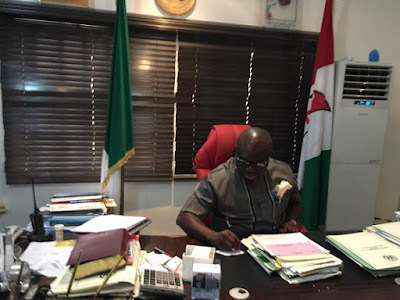 Abia State Governor, Dr Okezie Ikpeazu has called on the Chief Justice of Nigeria, (CJN) Justice Mahmud Mohammed and the National Judicial Council (NJC) to investigate what he described as “irreparable injustice” meted on him by Justice Okon Abang of the Abuja Division of the Federal High Court. In a letter to CJN and NJC, Governor Ikpeazu Said that Justice Abang’s acts of abuse of office and denial of justice has thrown Abia State into turmoil, adding that there is grave political uncertainty and total breakdown of law and order in the State. He therefore called on NJC to investigate and take necessary disciplinary action against Justice Abang. The petition titled: “ABUSE OF JUDICIAL POWER AND INJUSTICE METED TO DR. OKEZIE IKPEAZU BY HON. JUSTICE OKON ABANG OF THE ABUJA DIVISION OF THE FEDERAL HIGH COURT IN SUIT NO. FHC/ABJ/CS/71/2016. ” I am one of the legal counsel engaged by Dr Okezie Ikpeazu in the prosecution of the above matter and have his instructions to bring to your attention and that of the esteemed members of the National Judicial Council the irreparable injustice meted to him by Hon. Justice Okon Abang. “On June 27, 2016, Hon. Justice Okon Abang delivered oral judgment in the said suit with a pronouncement in court that copies of the judgment will be made available to parties within seven days. “A few hours after delivery of the judgment, we sent formal requests for the written copies of the judgments, filed a notice of appeal and an application for stay of execution of the orders of the court. The filed copies of the notice of appeal and applications for stay of execution were duly served on all parties, including INEC, on the same day. “On receipt of our notice of appeal and application to stay execution of the orders of the court, Justice Abang surreptitiously and without our knowledge enrolled a seven paged order signed by him and delivered same to the plaintiff to enable him enforce the orders contained in his enrolled judgment thereby truncating the petitioner’s rights to appeal against the judgment. “I make bold to state , with due respect, that the enrolled order signed by Justice Abang apart from being prepared without a written judgment, did not emanate from the reliefs being sought by the plaintiff in the matter but intended solely to remove our client from office and replace him with the plaintiff, UcheOgah. “The aforementioned act of enrolling the judgment was done without the existence of any final judgment in writing which act is contrary to the provisions of Order IV, 1 (2) of the Judgment Enforcement Rules which stipulates that no enforcement process shall issue until three days after final judgment has been delivered. “Furthermore, Justice Abang’s act of enrolling the judgment was done in disregard of the provisions of Section 143 of the Electoral Act which stipulates that the petitioner shall remain in office until determination of his appeal to the appellate courts. “On the strength of the enrolled order issued to the plaintiff by Justice Abang, the plaintiff proceeded to INEC and got INEC to enforce the judgment of Justice Abang less than twenty fours after delivery in an attempt at truncating our client’s rights of appeal as provided by the Constitution. “It is important to state here that despite Justice Abang’s zeal in enrolling his order for enforcement, he has up till this moment as we write (which is four clear days after delivery of the judgment) refused to release the court file to the registry of the Federal High Court for compilation of records and has not made available signed copies of the judgment to us despite repeated demands.